Coloured Water Quality Italian Archelitro Bottle Swing Top. Dimensions 500ml capacity. 27cm tall. The latest Bormioli Rocco Archelitro bottle comes in a choice of 5 attractive colours. Mix and match with our green, blue, purple and clear jars to create the perfect theme for your cocktail party, high tea or for an attractive wedding arrangement. The blue, fuchsia and green also match our coloured wine goblets. Note the bottles come with a textured glass and are not smooth glass like the picture which shows the colours only for illustrative purposes. Choose from Sky Blue, Fuchsia, Red, Purple and Green. The colour is sprayed to the outside of the bottle with organic colour for food safe handling. The Bormioli Rocco Swing top bottle has a number of practical uses. Store oils, vinegars, home made cordials and fruit liqueurs. 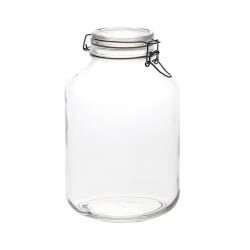 This larger size is also perfect for saving fermented drinks such as kombucha and kefir. As infused vinegars and oils have become increasingly popular for use as dips, dressings, or as an alternative to cream based recipes,these bottles are perfect for the home gourmet. When making homemade infused oils it’s important to take proper food safety precautions – storing without refrigeration is not recommended. Even so, infused oil blends make unique and thoughtful gifts for many occasions. Already popular in Italy, creative gifting can include a glass jar like Swing, a wonderful bottle of olive oil, vinegar, and a separate packet of dried herbs with instructions for proper mixing and storage. 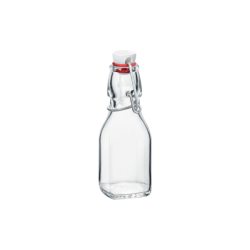 The blank bottle is plain glass with no embossing whilst the patterned bottle features an attractive pattern on the bottle making it perfect for entertaining. 1 Litre capacity. 31cm tall. 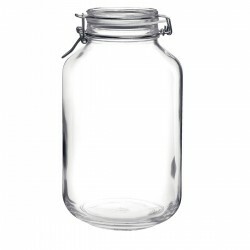 These are high quality jar made in Italy and with a sturdy wire bail, unlike some cheap imitations available in discount stores! 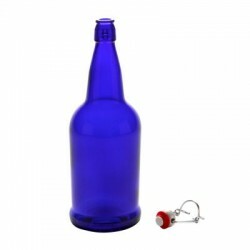 Oil / Vinegar / Squash Fido Swing Top 500ml bottleThe Bormioli Rocco Swing top bottle has a numb..